The TVS (Twin Vertical Saw) uses thin-kerf blades to efficiently remove the two vertical sides of logs up to 400mm in diameter. The TVS is cost-effective, versatile, designed for high performance, and built strong for years of reliable service. 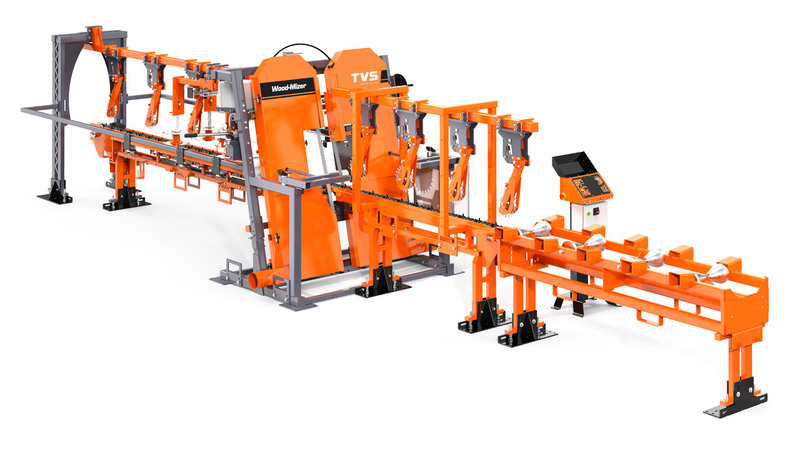 The TVS works equally well as a stand-alone unit or integrated with an existing sawmill line. A movable control stand holds all controls for chain feed speed, cut width, laser activation, and optional Setworks. The Setworks stores five different pre-set widths, which enable the operator to change cut sizes quickly depending on log size, reducing the need to sort logs first. Various feed system configurations make the TVS one of the most flexible solutions for removing two sides of straight logs, curved logs, logs with a flat surface, and slabs from 0-25m per minute. - The V feed system advances logs one at a time through the TVS. Spiked hold-downs guide the log. The lug spacing can be moved to suit the standard log lengths. This is a good option for straight logs with standard lengths. - The spiky chain feed system with heavy, spiked top-rollers adds greater stability to the log as it goes through the TVS. Logs can be loaded onto the feed chain with little or no gap between them. This option is ideal for increasing productivity with straight and curved logs. The outfeed bed has three options for slabs handling. - Side Disks – pneumatically operated side arms that hold the side board against the log until it reaches the desired drop zone. The arms open and release the two side boards together. - Side Rollers – spiral rollers are fitted along both sides of the outfeed bed, and as the log gets sawn the side boards fall onto the side rollers and gradually get moved outwards until they fall onto the cross transfer table. - Economy Version – This bed has no spiral rollers or side disks, and the side boards fall directly onto a cross transfer conveyor. - Cant processing - For squaring up timber which already has two flat cut surfaces, a flat feed chain is available with heavy, spiked top-rollers. This is commonly used when two TVS units are used in line together. - Slab edging - Another popular use for the TVS is for the slab recovery line. Large slabs can be put through the TVS and then fed down to a resaw or multi head resaw. Cut two side of the log in one pass. Wood-Mizer’s industrial blade lubrication system keeps both sides of the blade clean during cutting. Centralised tension system tensions both blades at once. Simple chain feed design for standard log lengths. Hold-down rollers keep the log in position and secure. Combining heavy spiked rollers with a spikey chain feed results in more productivity and improved stability for curved logs. The flat chain feed with heavy, spikey hold-downs is designed for timber to be cut that already has one flat side.